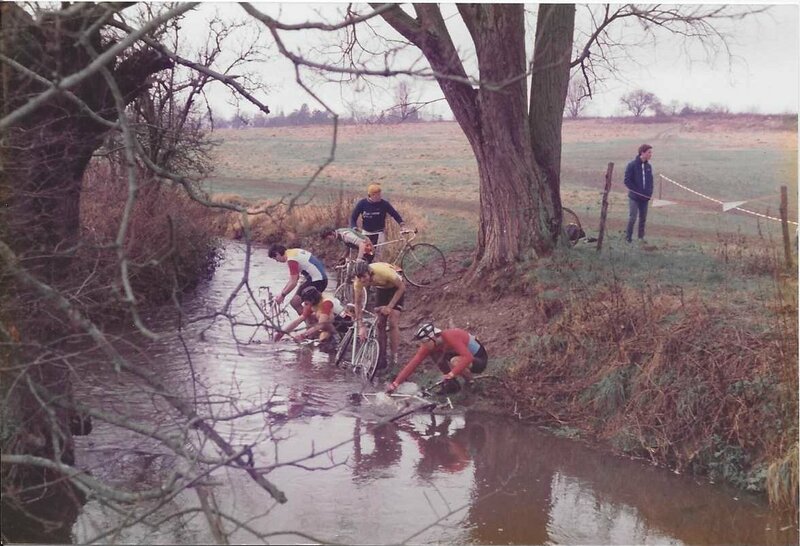 The London Cyclo-Cross association came into being in the 1950’s and a league has run ever since, although in the 2000’s we added ‘South East’ to the League title as many races are not actually held in London. In those early years it was oh so much simpler for the LCCA to promote at venues which were happy to accommodate us with a minimum of fuss, but now it’s not so clear cut. I have been an avid cyclo-cross fan for far too long, racing in the late 80’s in the 90’s and then turning to snapping and administration from then on. In that time I have been to many varied venues, some of which are now no longer on the calendar. Listed below are venues that are lost, hiding or under threat in the London and South East of England. This list was inspired by our 10 year look back at the loss of old Eastway, a venue which had been an important part of the fabric of cycling generally, and memories posted to the LCCA Facebook page. Paul Gibbs, Glyn Durrant, Tony Bartlett, Brian Curtis, Stuart Kinnon and others have been a gold mine of information and a source of pictures for so many lost courses. In addition to those featured in detail, they have also helped compile a long list of venues for which little information exists such as: Tilgate Park in Crawley (Buchan Park), Cutten Mill, Elthorne Park, Lloyd Park, Inholms lane, Banstead Downs, Summerhill Farm Nr Hailsham ,London, The scout hut, Beacon Hill, Faygate, Redhill Common, Earlswood Common (just once), French St Common, Farthing Downs (runners v. cyclists), Hanwell and Battersea Park, London. “1997/98/99 there was a Saturday point’s league at Darenth Run by the Dartford Whls. I rode there 7 times.” Stuart is correct to mention this promotion as this was the Handicap Series held over 4 rounds at Darenth Country Park. Another venue was used by Charlottesville CC when they promoted Round 5 of the London Cyclo-Cross League on Sunday 21 October at Riverside Park, Guildford in 2001.Paul Tunnell had this to say: about another lost course: “There was also an event at Chobham Convent, Surrey where there was a massive bar gate with rows of barbed wire on the top and they threw a piece of carpet over it so we could clamber over. That bit I remember but not much else”. Brian Curtis says of Chobham: “I rode a national juvenile champs where they cut the top row of the barbed wire fence out and stuck a straw bale either side of the 2 remaining lower ones so not to get cut on them….and yes Paul I did also hop”. “Knockmill Farm was the other side of the A20 from Brandshatch Motor Racing Circuit in Kent. We used to run MTB races there in the very early days (of MTB) that Chris May from Wigmore used to come and win. He used to race his MTB at Brandshatch and stay in the bunch.” Marco Faimali remembered the venue as a “ploughed up field that got used on Saturdays in the early 90s”. Other notable lost courses cited by our team of cross scholars include Shirley Hills, Battersea Park, Wimbledon Common and Hanwell all once set in London. Looking at the pictures and reading the memories of older riders we get to see and feel some of the heritage that is the foundations of cyclo-cross and whilst for older generation ‘Shirley Hills’ will conjure up memories, newer converts may feel much the same about ‘Wivelsden’. The reasons why we have lost these courses are myriad: The first point of contact between landowner (both private and public) and race organiser is often much about knowing people on a personal level. Having a friendly ear in a local authority or a school can pay dividends when you begin to explain what hosting a cyclo-cross race can entail, and the need to offset the fear of the unknown. When such a relationship ends then new staff can baulk at the idea of a park being ‘torn up’ by cyclists. Of course this can be mitigated with a renewed charm offensive. A number of school venues have been lost because a keen cycling teacher had left and the enthusiasm within the school for the event is lost. For many it’s simply easier to say no. Similarly if a cycle club loses its cross promoter the event can go with them (not just cross can suffer this fate) if no one steps up to take it on no matter how long the club might have promoted it. Some venues have been lost because of local government changes and more stringent guidelines often creating greater red tape to overcome, in the past a race organiser might have had to deal with a single decision making department but now in so many local authorities et al. there can be numerous people that need to be pleased and each with their own remit. Some people say that we have lost too many inner town or city venues and this is only partly true as most lost courses were not be found so centrally. But of course some courses have been lost because of development and greater numbers of users. The impact of development across London and South East means the potential for greater conflict with other park users has increased. Dog walkers inconvenienced for one day out of 365 can complain so hard that they simply tread down a land owner’s willingness to host an event. Some local users and also those who drive some distance to allow their dogs to walk and poo will lay siege to a park’s department or land owner to demand their right to access. Others take more direct action by tearing down course marking tape and the like. For me the attitude of our continental neighbours helps illustrate an often witnessed UK mind-set. If in France, Belgium, Germany or Spain an event is held the locals seem to embrace it and are glad to see an event held in their locale whether it be any sport or cultural event, whilst here we often get – ‘you can’t stop me from using the area’! For many modern Brit’s there is no sense of community rather the ‘me first’ attitude is ingrained deeply in the psyche. Although cyclo-cross does make a mess especially when wet, cycle tyres do not dig deeply enough into the soil such as motorised wheels to create great damage and this means that grassland can recover amazingly quickly. Land that can look terrible at the end of the day will look so much better to the good just a week later. If damage is a little more than usual because of severe rain etc., then a surcharge fee is often part of the hire agreement to make right any damage. On that theme I should also mention that some venues are or became far too expensive to hire. An important aspect are the actions of competitors, locals and landowners who might have embraced the event can soon be turned off by inconsiderate actions such as washing bikes in showers, or not taking off muddy shoes indoors or parking inconsiderately, Some cross courses have been lost because showers have been left looking like the retreat from Moscow! When the league began in the 1950’s a good field might see 40 odd riders in all categories taking part, this number increased to somewhere near a 100 or so by the end of the 1990’s. Now in 2016 cyclo-cross has become so popular that leagues up and down the country have had to increase the number of races held at each event and with some 400 odd riders taking part some courses really are not big enough to accommodate the new popularity of cross. In general the courses and venues listed below have been lost for the following reasons: Local hostility, development, council cuts, a change in relationship between landowner and organiser, club organisers standing down, fear of damage to a venue and increased paperwork. A modern reason may also be the loss of kinship not only across the UK diaspora. But also as more cyclists turn to Strava and away from the traditional club community leading to the numbers of volunteers available to put on events being reduced. So we have our memories as illustrated in this feature but we also still have a vibrant cyclo-cross scene holding events at venues for many years and still able to find new ones. But we cannot be complacent and even now any one of the venues known to the modern crosser may join our ‘lost cyclo-cross course’ list. The following lists have been collated from the posts on the London Cyclo-Cross Assoc/ Facebook page. Maryon Wilson Park, London courtesy of Stuart Kinnon 1990’s. Post script – since this feature was published we have taken the number of lost courses to almost 100.